Remember Freedom Bags? We had a post on them not so long ago, where we basically wrote them off as a not very good idea. 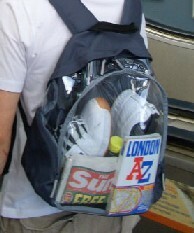 In case you don't remember, the basic idea of Freedom Bags was to produce transparent rucksacks which commuters could use to prove they "were no threat". After the post, our friends over at the London Underground blog picked up on the whole Freedom Bags idea, and seemed to have much the same reaction we did. However what they did next is really above and beyound the blogging call of duty: they went and interviewed the man behind Freedom Bags, Bob Fitzjohn. Rather tellingly, Bob also refuses to say how many Freedom Bags have been sold, although he does express some surprise that of all his orders " from around the UK and around the world", he's had very few from London itself.